Today's post is dedicated to a little-known office in the U.S. Department of Agriculture that has been in the news lately due to some ill-advised Facebook posturing by one of its agents. 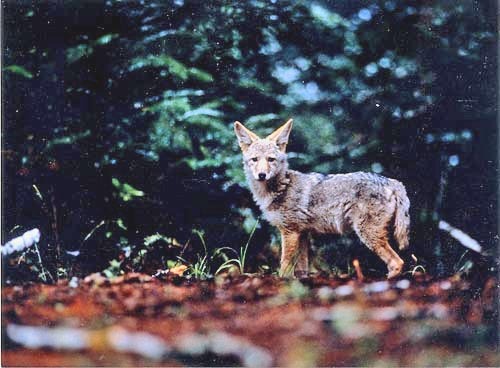 Borrowing from my friend Jodi's practice on her excellent blog Heart Like a Dog, today I can't suppress a great big WTF about a Wyoming coyote trapper employed by the federal government who posted photos of his dogs torturing and killing a trapped coyote. I wont post the photos here but you can see them at the links to the news coverage below. They reveal not just an indifference to suffering but a gleeful enjoyment of it that is nurtured by a certain element of American culture that would be right at home at a medieval spectacle of drawing and quartering. Have we evolved at all since then? 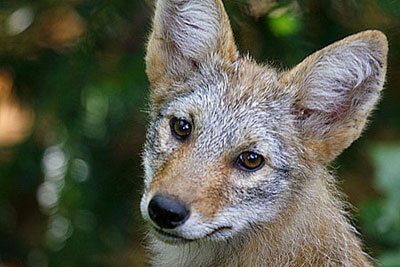 Any instance of animal suffering is intolerable but coyotes are just wild cousins of the dogs we love and I cannot fathom how it is that a large sector of the U.S. population--including a taxpayer funded federal office, "Wildlife Services," formerly known by the less euphemistic name Animal Damage Control--wants to exterminate them and even see them suffer. When I worked for WildEarth Guardians in New Mexico I investigated this agency as part of my work to reform the Western public lands livestock industry. Many of the requests Wildlife Services receives to kill wildlife-- coyotes, wolves, prairie dogs--come from ranchers who see wild creatures as nothing more than competition to their stock. Using our tax dollars, Wildlife Services agents then go into the field and put out poison (which can be ingested by family dogs and of course any number of nontarget wildlife species), set cruel and undiscriminating leghold traps, shoot vast numbers of wolves and coyotes from helicopters, and gas mountain lion cubs in their dens. You can learn more about the 26 million animals killed between 2004 and 2011 at an annual taxpayer cost of $100 million here. The particular photos at issue were posted on Facebook by Jamie Olson, a Wildlife Services trapper from Wyoming who says he was only trying to impress his father with how well trained his dog was (to rip apart a coyote who was held immobile in a leghold trap). Fortunately, activists found the photos and demanded an investigation, and the Sacramento Bee is continuing its extraordinary ongoing expose on Wildlife Services with coverage of the incident. To me it is absolutely irrelevant whether Olson was working for Wildlife Services when he took the photos, and it is irrelevant that Wildlife Services' official yarn is that it does not condone torture and all wildlife killing should be "humane." According to Gary Strader, a former Wildlife Services agent who turned into a whistleblower, such antics are commonplace among the people who work for this institution, and such an institution has no place among the entities we support with our tax dollars. The fact is that the vast majority of American people love wildlife, and Wildlife Services still exists only because most people don't know about it. I have wished since I first found out about this office for some way to get the word out about what it does and generate a vast tide of public sentiment toward its reform. Perhaps these photos, and what they reveal about the depravity of an agency that hires the sort of person who tortures for sport, will generate that long-overdue momentum. And now that I have a blog and can post about it, and get all five of my readers to take action, well by jiminy change may be just around the corner! I urge everyone to learn more and join efforts to defund and eliminate, or at least radically reform, this retrograde government subsidy to those who wish to destroy our natural heritage. WildEarth Guardians has a petition here and there is a Causes.com petition here, and the websites of WildEarth Guardians and Predator Defense offer more resources for getting involved. Shameful. It breaks my heart when I hear about these things. I'm not going to look at the photos but I'm so glad you did post about this. I want to learn more and will check out your links. While the torture aspect of this is wrong, and should certainly not be condoned, this type of agency needs to exist. Who do you think is supposed to take care of the cougar who came into town where I live, attacking and killing a number of dogs in fenced yard and posing a threat to the human residents (especially children)? And the coyote and cougar populations are out of control in many areas, way above what would naturally be able to be sustained without those animals having livestock to prey on. Restrictions on hunting these animals has caused an unnatural boom in their populations (check out how much the cougar population has grown since Oregon banned the use of dogs to hunt cougar). My dog was attacked by a coyote just outside of town on a popular walking/running/biking trail in the middle of the day. I'd advocate the use of non-lethal, humane control in those situations where there is a legitimate conflict between wildlife and human populations. Check out http://www.humanesociety.org/animal_community/shelters/humane_wildlife_services.html for resources on finding humane methods and companies that use them. I would also argue that a large proportion of Wildlife Services' "services" are to protect livestock grazed on public lands at taxpayer expense. These livestock contribute less than 3% of the American beef supply and their economic contribution to the ranchers who exploit this privilege is negligible. You can find out more here http://www.publiclandsranching.org/htmlres/fs_grazing_economics.htm. Finally, many common-sense precautions against predation, such as removing carcasses of cows and sheep who have died of starvation or other natural causes so that coyotes and wolves do not scavenge, and become habituated to beef or mutton, are ignored as the industry is habituated to rely on the handouts provided by Wildlife Services. I had no idea about any of this. So informative, thanks for posting about it all! I see this is your version of our shark and dingo attacks. Humans always take precedence, even if it was human encroachment into wild spaces that led to the animals coming into our backyards. This morning, I heard a lady on local radio defending the export of live animals from Australia. What was her argument? That that there will always be some bad people [meaning the importers no doubt] and of course, it'll be devastating financially for the livestock industry if live export was banned. I can't sigh enough over people who don't or can't respect the lives of other sentient beings. Wow. Thanks for bringing my attention to this --- like finnhoward, I had no idea. But will do my small part to be vocal and take action. Thank you for posting this. This just pisses me off. I hate that animals are killed because they are considered a nuisance, yet I do understand if the animals are a danger to the public. What I don't understand is why the animals can't be caught and relocated? You can bet I'll be signing these petitions Kirsten, and I'll have something to say to my state rep when I get in there to talk to him about my plans for animal welfare reform! Thank you for bringing this to my attention and also for the shout out. My WTF badge is on my page, feel free to use it any time!! Signed and sent; cruelty is never, ever rational.